MPS models in IDEA look great! A guide how to use IDEA integration will probably be available with the release, but I was impatient to try it. I was able to create java models (class, interface, etc..), - is it possible to create models in other languages as well? I've added some languages in the MPS facet, but no other root kinds became available..
A bit fast to follow.. Fixed by moving project to the same drive as MPS. Copied the idea plugin to idea.. can see it in the list of plugins. In Model Properties > Imported Models, I cannot add the language - it's not in the list! The generated plugin looks ok.. attaching jars from it. Is it possible to reference java classes in the java+mps module from mps models? I was not able to.. It is not possible with MPS 2.5. In this release you can only add references from MPS models to library classes available in this java module or use generated java code from normal java. In the next version (MPS 3.0) we are going to support the possibility to reference java source code from MPS model. To quickly check everything is ok with language package you can copy SimpleIDEAPlugin.jar into IDEA_HOME/plugins/mps-core/languages/ folder (the folder with all the languages distributed with mps plugin) and restart IDEA. If you will be able to use your language in this case this means language was packed properly, is functional and the problem is definitely in packaging logic. 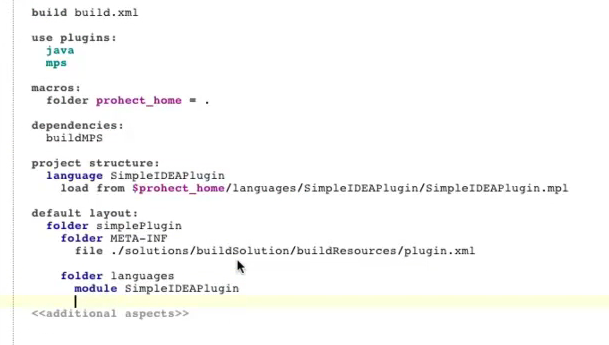 In this case you can delete IDEA_HOME/plugins/mps-core/languages/SimpleIDEAPlugin.jar and try rebuilding this plugin to make it working separately. I've figured that out. JDK 7 is giving me hard time, again. Please, add "-source 1.5 -target 1.5" to ant task options, so that generated plugins are understood by IDEA.